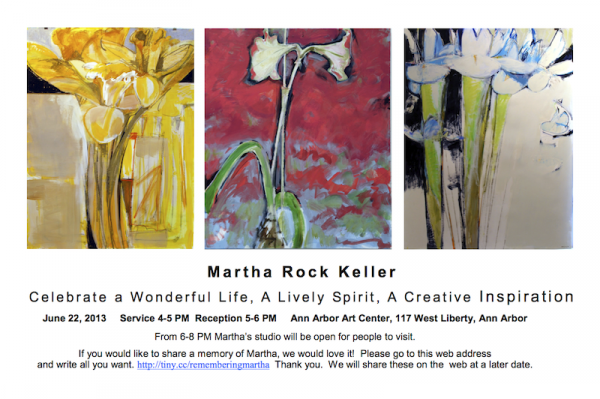 From 6-8 PM Martha’s studio will be open for people to visit. If you would like to share a memory of Martha, we would love it! Please go here and write all you want. Thank you. We will share these on the web at a later date. Sadly Martha passed away February 13, 2013. You can read an obituary here. 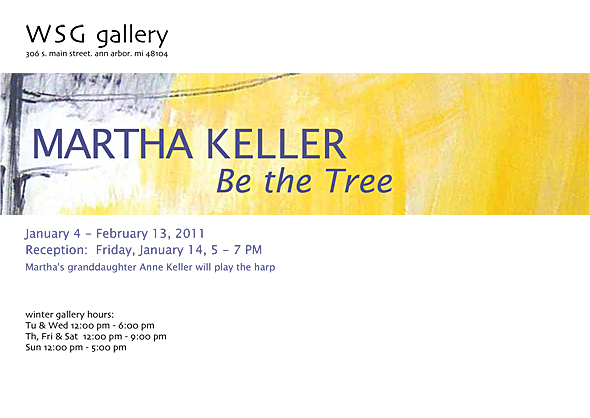 These tree paintings continue my last 2008 show of evergreen paintings at WSG, “The Next Brushstroke.” Those paintings emphasized the drama between detail, the single brushstroke and the unified whole image. These paintings have a warmer palette. They are meant to suggest that the interplay of light in the sky and branches are metaphors for ideas – for playfulness and inventiveness, potential for a warmer, brighter future. The trees depicted have been transformed into paint with all its expressiveness! They are based on longtime day-to-day close observation and the joy of seeing real evergreens surrounding Dow Field in the Arboretum and the white pines in our back yard. My first pine tree painting dating from the late 1930s was about mimesis, getting the painting to look like a grove of pine trees. Now I’m interested in how the subject can organize and build the perceptual and emotional depth of the painting, the flow of the paint and the interplay of its contrasting, painterly qualities. Those qualities can suggest serenity and calm as well as the intensely focused energy of a meditation. Cezanne was said to identify with the landscape he painted; he was perhaps the first to “be the tree” he was painting. He seems to me to have generated a kind of blissful transcendence of seeing the natural world. You are in my eye. How else can I see the light? This show continues a previous show, “The Next Brushstroke”. It’s about the dialogue between individual brushstrokes, and the narrative they have, and the overall image, the total narrative of the painting. It’s got a warmer palette, the skies are warm and sunny, instead of blue and cool as they were before. I’m thinking about light in the branches and light bouncing around in the tree. And I’m thinking of myself as a tree – “Be the Tree” – to get me more focused on the whole project. 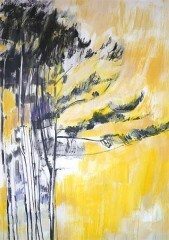 “Clearing” is a triptych that represents a hillside and central valley in the U-M Arboretum in Ann Arboretum. This photograph was taken at my recent Retrospective. While I’m immersed in painting, each brushstroke becomes a lesson in seeing. It looks backward and forward at the same time; it sums up and refreshes previous brushstrokes while entering new territory. I think of each brushstroke as a narrative with a beginning, middle and end that builds with other brushstrokes into the overall “story” of the work. My thought and feeling associated with the brushstroke depends on many factors: inspiration, awareness, the reach of my imagination, my capacity for intense concentration that day – and even the barometric pressure. Within the painting’s structure, edges intrigue me particularly because they determine the separation or connection of imagery over boundaries. The inter-relation of contrasting features also interests me enormously. If the painting works, it almost paints itself, building a sense of flowing energy and release. I aim for this release – a sense of freedom, a feeling of expansiveness and peaceful calm that is casual, reassuring and fully awake. I also aim for flexibility and openness to new ways of sensing space and form. After the exercise in seeing that painting gives me, the real world becomes ever more exciting and interesting – a visual paradise. Art is like a storage battery – an energy field that can recharge us for life. These paintings are about two landscapes I love: the Arb here in Ann Arbor which, in my view, is a quintessential landscape for hiking and exploring nature; and the dunes and bluffs of the Sleeping Bear area of the Lake Michigan shore near Glen Arbor – both of which I’ve been painting for many years. While painting, I’m forever in pursuit of ‘the next brushstroke.’ For while the present brushstroke sums up previous brushstrokes, and defines the present moment of calm certitude or energetic action, ‘the next brushstroke’ potentially sparks creative freedom and surprise.